← Irish Blog Awards – Vote For Us! Rooms with low ceilings can make rooms (be they large or small) seem much smaller. The low ceiling limits the sense of space and can make the room feel darker too. Conversely, rooms with high ceilings, even if the floor space isn’t as large as you might think, create a wonderful sense of space. Indeed, many halls in new builds have a double height ceiling which really opens the sense of space. Of course, low ceilings have their advantages, the room seems cosier and is certainly easier to heat. If you want to create a cosy atmosphere in a television room or a den, a low ceiling is perfect but what if you’d like to create more of a sense of space? How do you make that ceiling appear higher? Most ceilings are painted white and it is certainly the most effective colour in ‘raising the roof’. Dark colours, even a dark grey white, will make the ceiling appear lower, particularly if the walls are a light colour. Horizontal stripes will make a room look wider, vertical stripes will make it appear higher. If you’re not so sure about painting even stripes on your walls, choose a striped wallpaper such as this chocolate Java from Graham and Brown. A wallpaper with just two contrasting colours e.g. black and white, will look quite striking but might be too severe for a living area. Opt for a wallpaper with at least three colours for a warmer effect. Your stripes don’t have to be in straight lines and indeed, many wallpaper designs feature objects displayed in a vertical line. These will also make the room appear higher without being as obvious as being a straight stripe. 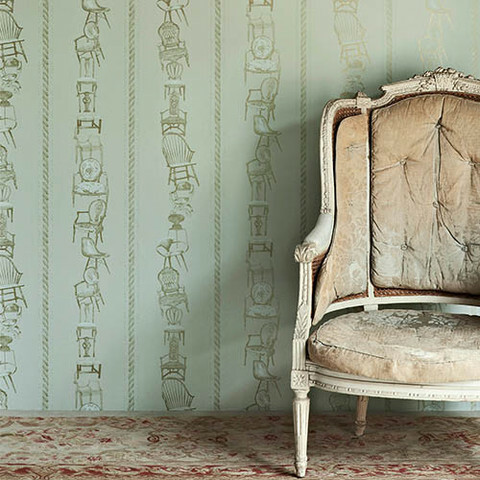 An example is the charming Chairs wallpaper by Barneby and Gates. The stacking of the chairs is quirky and fun and yes, irregular, but they are kept in line by the rope effect stripe. If the furniture in the room is low, e.g. a low backed sofa rather than high-backed Victorian armchairs, it means that more wall space is visible between the ceiling and the top of the furniture. This will increase the sense of space. Think about your lighting too. Using uplighters to shine light upwards, particularly in the corners of the room, will raise the ceiling. Wall lights that cast the light upwards will also work well. Don’t get a low hanging central chandelier or a large light fitting but let the central light fitting be an inobtrusive as possible, putting the emphasis on lamps, wall lights or uplighters. You might think that you should keep the curtains lower down but the opposite is true, lift the top of the curtains close to the ceiling to give them a sense of height. The same goes for hanging pictures, display smaller pictures in two vertical lines rather than creating a horizontal line around the room with your frames. If you have shelves, place them high on the wall too to raise a person’s eyes to the items displayed there. If you have a room with a low ceiling and you’d really like to “open it up a little” but have neither the time nor the energy to get the paintbrushes or the wallpaper paste out, then fear not, we can get you up to four quotes from rated decorators in your area. All you have to do is register your request here, telling us exactly what you would like done (eg. in the short description write ‘painting and wallpaper’ and in the longer description, give us more details e.g. a 14 x 16 foot living room ceiling painted, skirting boards painted, and four walls prepped and wallpapered) and we will organise the rest. We can even help with the wallpaper choices if you opt for an Interior designer on our request page, although we hope our recommendations give you some ideas too. This entry was posted in Decorating Tips and tagged decorating tips, decorating with wallpaper, how to make a ceiling appear higher, interior design tips, wallpaper, which wallpaper. Bookmark the permalink.